Our cover is provided on the basis that you secure your bicycle with an adequate Sold Secure rated lock when leaving it in public. There are a wide range of secure and affordable bicycle locks available. Many locks come with additional security cables, which are intended for securing wheels and accessories. 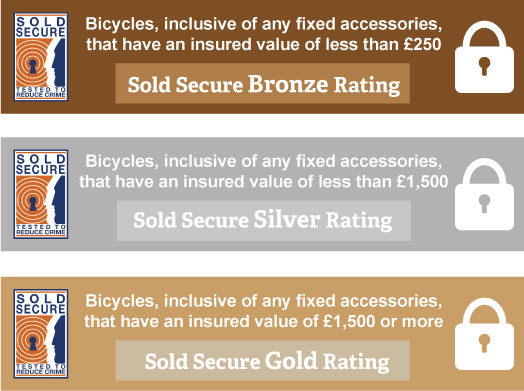 In order to make a successful claim for cycle theft, you must use a Sold Secure lock with a rating of either Bronze, Silver or Gold, depending on the value of the bicycle. It is a condition of cover that you adequately secure your bicycle with an approved lock to an immovable object when you leave it in a public or communal place. We do not require you to lock your bicycle when it is being kept at home, so long as it is not visible from the exterior of your property and that it is not accessible by anyone other than members of your household. If you are unable to provide any of the above, we will accept two clear photographs of your lock, one separately from, and one locked to your insured bicycle where we can clearly see the lock make and model. Photographs must be supplied to us before you need to make a claim. When leaving your bike unattended in a public place, you need to ensure that it has been locked correctly in order for your insurance to remain valid. We’ve put together a handy guide on how to lock your bike in accordance with our policy requirements.